The speed of the ill-fated Amtrak train that derailed in Philadelphia on Tuesday night accelerated right before the crash, authorities revealed today. Investigators with the National Transportation Safety Board have said the train was traveling in excess speeds of 100 mph at the time of the crash -- twice the speed limit in that section of track -- right before the crash. The NTSB's Robert Sumwalt said the train's engineer, Brandon Bostian, has agreed to speak with investigators and they plan to do so sometime in "the next few days." Bostian, 32, of Queens, New York, was “very distraught” to learn that the crash killed passengers in the crash, his attorney, Robert Goggin, told ABC News. He added that Bostian voluntarily turned over a blood sample and his cell phone and is cooperating with authorities. Emergency personnel work at the scene of a deadly train wreck, May 13, 2015, in Philadelphia. Sumwalt said video from inside the cabin shows that 65 seconds before the crash, the train’s speed went above 70 mph. Just 16 seconds before the end of the recording, the train’s speed went above 100 mph, Sumwalt added. "Seconds into the turn, we could see the train tilting 10 degrees to the right,” he said. That's when the train crashed and the recording went blank. It is unclear, however, whether the train speed was increased manually, investigators said. Sumwalt said he wants to know Bostian's account of “what he recalls leading into this tragic event." 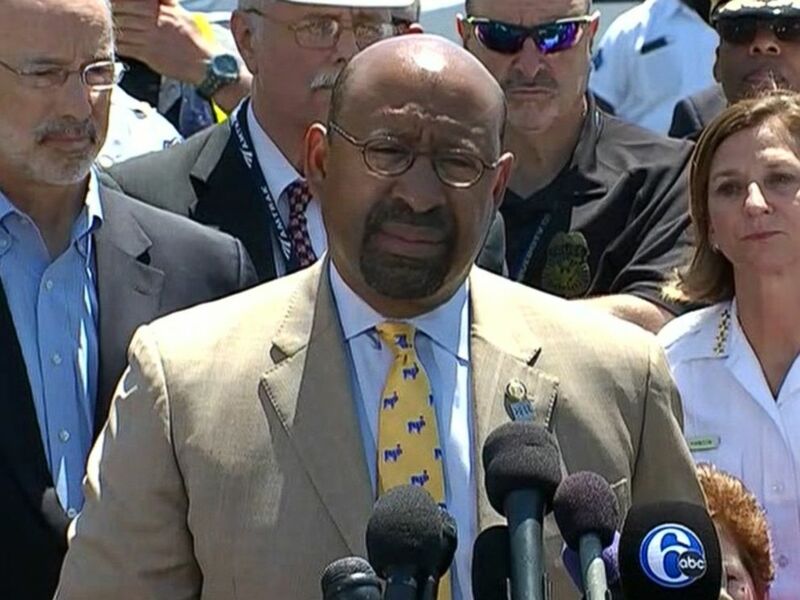 Philadelphia Mayor Michael Nutter speaks to the press about the deadly Amtrak train accident that occurred earlier in the week, May 14, 2015. Amtrak CEO Joseph Boardman today released a statement about the crash, saying the company takes "full responsibility and deeply apologizes for our role in this tragic event." "Passenger railroading is at its core about people; the safety of our passengers and employees was, is and always will be our No. 1 priority," read the statement from Boardman. "Our goal is to fully understand what happened and how we can prevent a similar tragedy from occurring in the future." Earlier today, Philadelphia Fire Commissioner Derrick Sawyer said that an eighth, and final, victim was found in the first car of the train at around 8 a.m. this morning with the help of cadaver dogs. He said that hydraulic tools were used "to open up the train a little bit" in order to retrieve the body. Laura Finamore, 47, and Bob Gildersleeve, Jr., 45, were the last victims to be identified. Nutter added that they have now been able to confirm the whereabouts of all 243 people that investigators believed were on the train at the time of the crash. 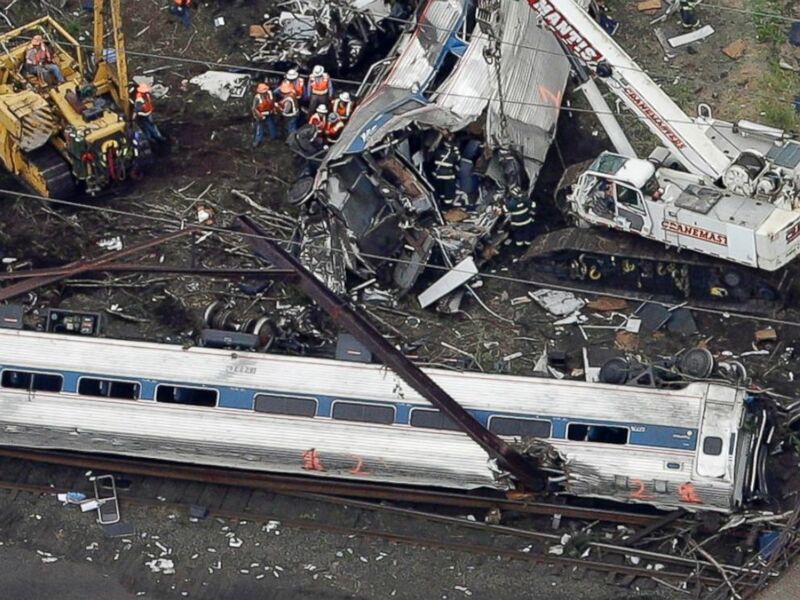 Amtrak now faces at least one lawsuit regarding Tuesday's crash. One of its employees, who was injured, filed the suit today, alleging Amtrak acted negligently leading up to the derailment. The lawsuit alleges Bruce Phillips suffered severe injuries, including a "traumatic brain injury," and "was violently hurled about the railcar, striking his body on numerous parts of the railcar interior, before slamming onto the floor." He asked for more than $150,000 in anticipated lost wages, according to the lawsuit. An Amtrak official declined to comment on the lawsuit. Service between New York and Philadelphia was expected to be suspended through next Monday while repairs were made to the affected track, Amtrak said in a statement.